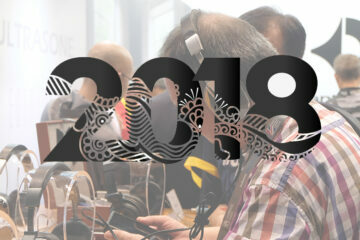 This report is the first of two parts and deals mainly with pure portable audio and in-ear gear. If you have never been to Singapore I highly recommend you go, even if not for shows like CanJam. Every year I am there I explore a little more of the city just to get a feel for what’s happening outside the show. This year I discovered a few places such as the excellent Mustafa Sopping Center near Lavender just up the road from our hotel. This is a bargain hunter’s dream with rows and rows of discounted products, cosmetics, and household gear. Great for gifts and avoiding the sadly expensive duty-free area of Changi Airport. The little walk up also had tons of beautiful looking boutique stores and eateries all nicely lit up. A leisurely and safe walk. 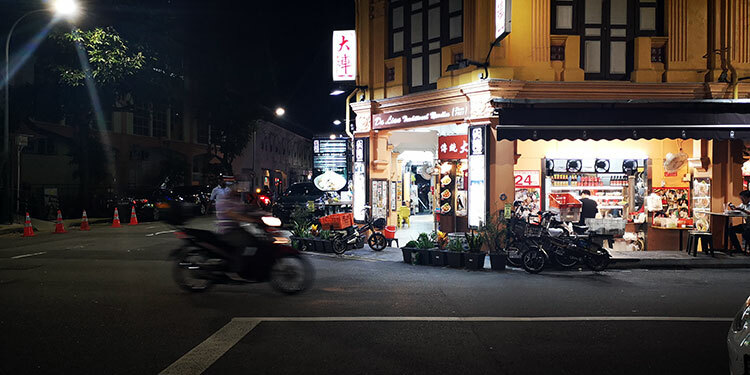 If like me, you find the downtown eating experience to be a bit on the pricey side then I advise looking for Hawker’s Centers around the city. These are little food courts that pop up everywhere from underneath malls to beside hotels. They offer a wide range of delicacies at competitive prices. 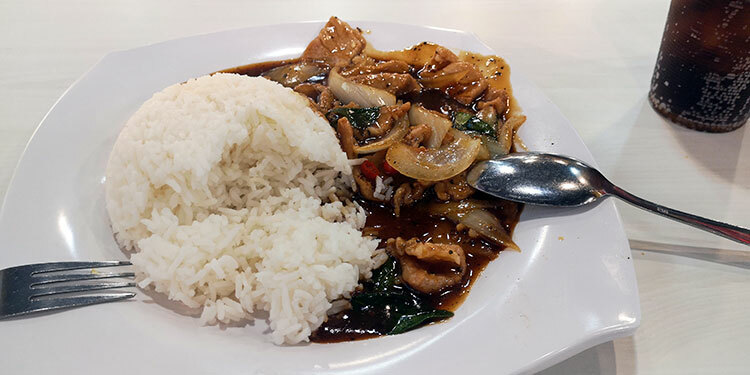 The end product doesn’t look as fancy as the big diners out there but it is filling such as this lovely tasting black pepper pork and rice for about SG$5. Perfect fuel for quick lunch breaks. 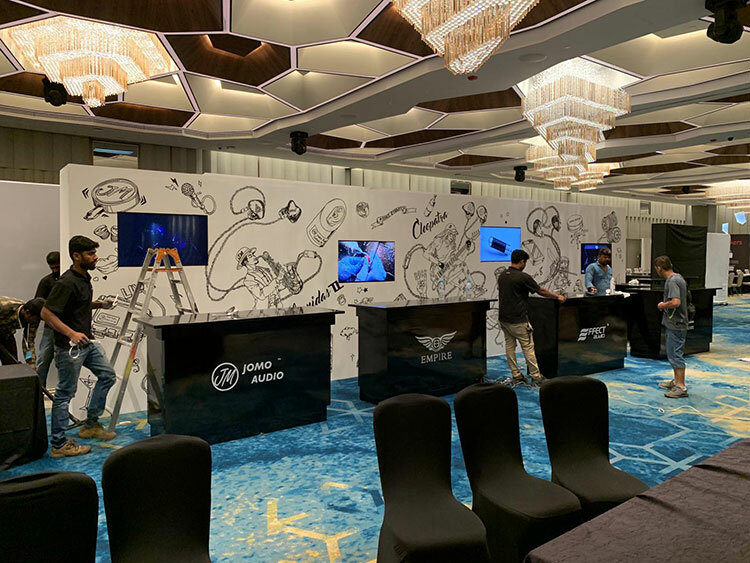 This year we had a lot of brands attending and a wide range of dealers who really upped their game in terms of attractive and well-stocked booths. At the last count, it was around 100 brands attending, up around 25% from 2018. Four dealers on the ground floor alone just blew me away with the scale of their setup and the range of their products and brands on display; Zeppelin & Co., Euphoria, Music Sanctuary, and Project Perfection. Between them, they must have accounted for about 1/3 of the bottom floor space alone. 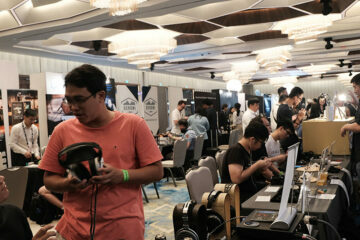 Upstairs we had some stunning summit-fi desktop gear also provided directly from surprise attendees such as Alex Rosson and his new planar RAD-0 and regulars such as Singapore’s STL with the amazing RAAL-requisite SR1a True Ribbon headphones. And not just them, we had plenty of manufacturer reps attend which I always welcome for their insight and casual chats. No matter how long you have been lingering in this industry you never fail to learn a thing or two or discover a new secret product after spending some time with these guys. This year I believe the show surpassed 2018’s headcount in terms of attendee’s and I can assure you the reps were doing double time in trying to cover every person who came to their booths. Once again, I missed a few brands I would have loved to have covered but sadly there are so many that 2 days is not enough to get around every single one. However, I did get come away very excited indeed with what I did get to hear. Let’s kick off with a visit to the team from Germany, Vision Ears. Long time admirer of their monitor tuning and they usually pick the show to present something new. Last year, it was the silver beast that is the Erlkonig. 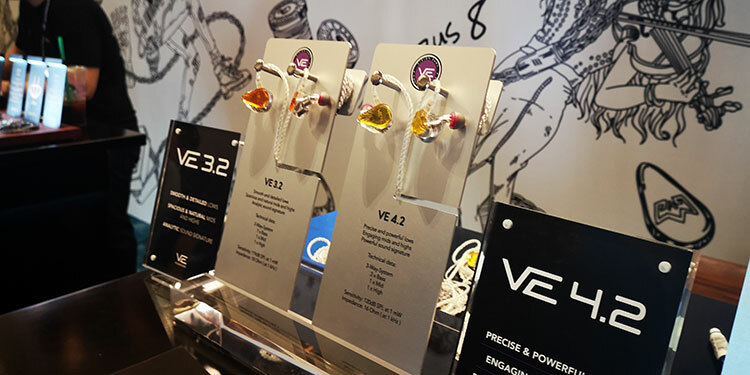 This year, we had 3 pre-launch products, the VE3.2, VE4.2 and the flagship monitor, the Elysium. 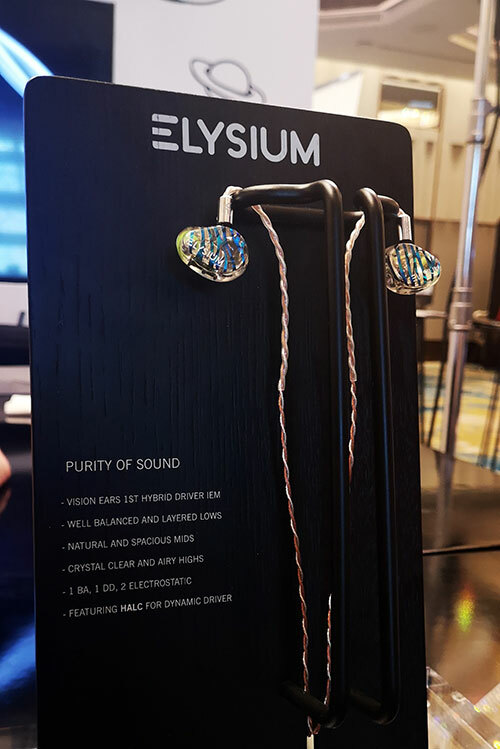 I went straight for the Elysium with its very unique mix of a single large BA for the lows, a dynamic driver for the mids and 2 electrostatic drivers for the highs. 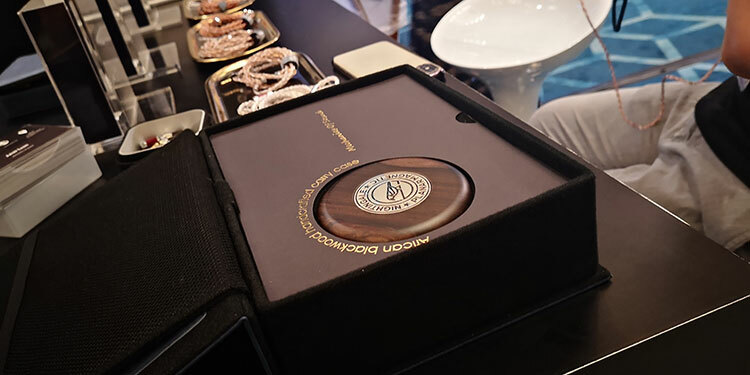 Stats IEM’s are THE design of 2019 so I was half expecting to know how this might sound but honestly, I was blown away. The signature is stunning with a beautifully focused and vivid midrange and a very detailed vocal delivery. There is an almost perfect blend of treble body and clarity also, perhaps the most refined stats tuning yet in a monitor and I have heard plenty of these thus far. There is no issue on the low-end for those worried about a BA low-end not being strong enough. The Elysium kicks hard but for me, the magic is the midrange dynamic driver. It sounds wonderful. 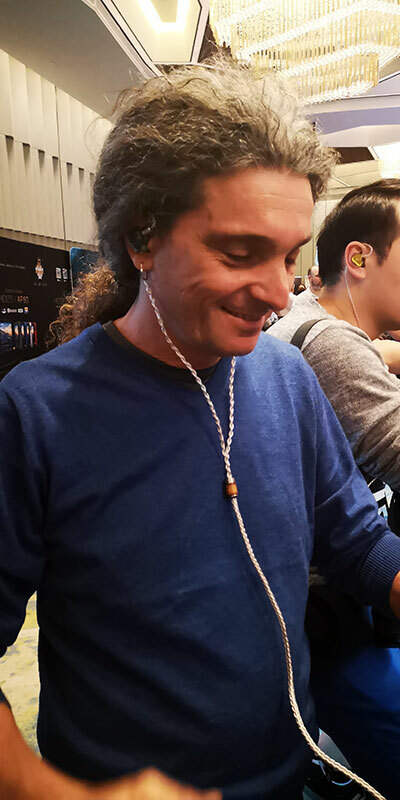 Now, it was initially connected with Effect Audio’s highly regarded Eros cable, but when I switched it to Leonidas II Octa it blew everyone away who heard it including Oliver, Marcel, and Amin of VE. Guys, this might be the perfect blend of custom monitor and cable. (Yup, that’s Amin and Oliver above with the Elysium hooked up to Effect Audio Leonidas II Octa). Expect a review in the coming months on Headfonics! 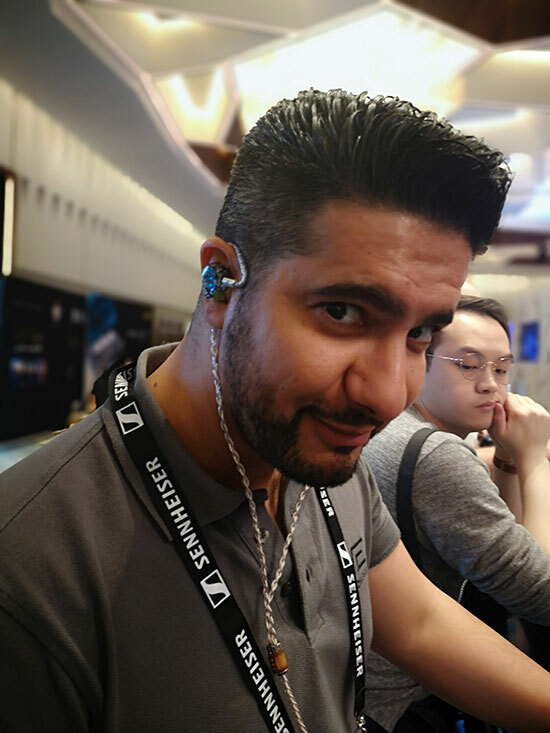 We were lucky enough to cover Leonidas II Octa and Cleopatra before the show started and you can read the reviews (via the link) in full. It was a pleasure to see Sy and Eric again and not only Effect Audio but the growing Euphoria Audio dealership of which EA is but one in a few brands such as VE, Empire Ears, Jomo Audio and now Campfire Audio. Probably the coolest moment was stealing the Leonidas II Octa from the EA booth and sticking it on the Elysium from the VE desk then watching Oliver of VE giggle involuntarily at what he heard. Moments of discovery like that make it all worth the while. For those wondering about the Cleopatra Octa, I did get to spend a short bit of time with it and wow, the power on the low-end is monstrous with my own JH Layla custom build using a convertible JH adapter with a bass module. The 4-wire will change how you think about silver cables, however, the 8-wire just ups the dynamic range so much. I shall be speaking to EA on the Cleo Octa soon I hope. I need to hear more. 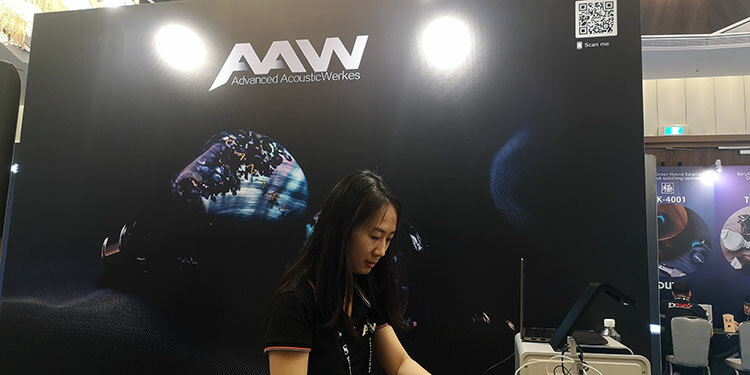 Kevin Wang and his AAW team had a full display of all the new products at this year’s show and boy have they been busy with new gear in the last few months. Front and center were their new Canary, Nightingale, and the Mockingbird monitors as well as the mid-range models such as the AXH on the other side. The nightingale was the first tested and we do also have a unit just arrived in for review so stay tuned on that one. This is a 15mm MPMTM micro planar magnetic driver universal monitor complete with their own excellent Symphonym Tiburon UPOCC Copper Cable. It retails for SG$$1,399.00 and they are making just 300 of them so a bit of a limited edition unit. I have to say I quite liked the presentation from the Nightingale. It sounds nicely balanced with a slightly warm to natural sound signature and decent soundstage but not expansive. I would say intimate but with good separation and a slightly forward vocal presence. Treble sounded buttery smooth with the supplied silicone tips so I would dare say anything like foams might make them a shade too dark. Quite a refined sound from the Nightingale so look forward to putting it through its paces in our forthcoming review. Just one caveat, the specs say 25Ω and 105dB SPL sensitivity but I had my Lotoo Paw Gold Touch on high gain 55 unbalanced (same power for both balanced and unbalanced with this DAP). I do think there is a possibility this monitor can scale well with good power. Now the Canary is the company’s high-end entry into the already very competitive electrostatic hybrid monitor market. It is priced at SG$2,999.00 and from what I can tell it is available in universal and custom format. 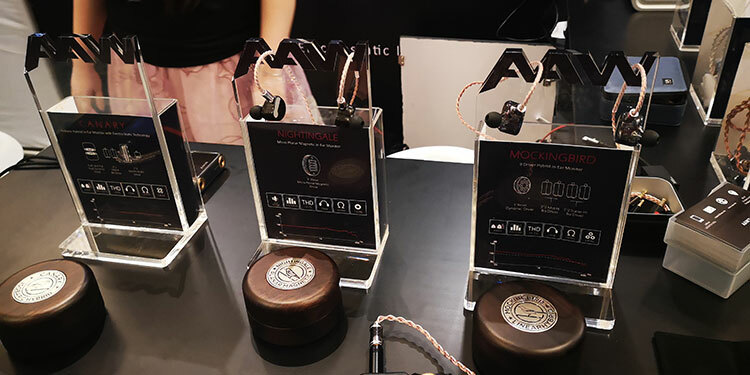 The configuration is also interesting and really just confirms my feeling that the stats hybrid IEMs market is very diverse right now with each company taking a very different approach. The Canary has a single 6mm isobaric push/pull woofer for the lows, 4 BA for the mids and highs and a dual electrostatic super tweeter setup for the very top-end. The isobaric 6mm dynamic driver is the one that caught my attention. This is a dual diaphragm and high strength neodymium magnet design that delivers inverse phasing between the two coils to eliminate typical DD non-linearities and reducing crossover impact on the BA drivers. In theory, this should help retain a strong low-end that does not bleed or dominate the lighter faster midrange BA’s. So what did I hear? On our initial and brief testing, the Canary sits between the Pola and Jomo Audio’s Trinity in terms of treble forwardness. It is not as relaxed as the Trinity but a little more laid-back and smoother than the Pola’s more neutral treble tuning. The detail is excellent, very good dynamic range and some nice vocal performances but not quite as forward sounding as Vision Ear’s new Elysium. You can hear the different approaches between these two right away. Definitely a refined monitor we are keen to put through some longer testing in a forthcoming review.